Heather Lang is the author of the new children's picture book biography Anybody's Game: Kathryn Johnston, the First Girl to Play Little League Baseball. 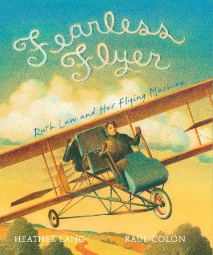 Lang's other books include Swimming with Sharks and Fearless Flyer. 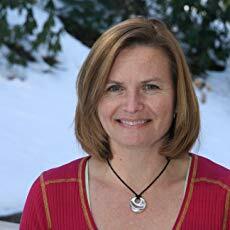 Q: How did you first learn about Kathryn Johnston? A: As a child, I was obsessed with baseball. I didn’t go anywhere without my mitt and played catch every day with my father and brother. When my own kids started playing Little League baseball and softball, those special memories came flooding back. I had the urge to research women in baseball to see if I could find a story to write. When I read in a book about Kathryn’s struggle to play Little League, I tried to imagine what my childhood would have been like without baseball and softball. I felt deeply connected to her struggle, and that was the spark for Anybody’s Game. Q: What kind of research did you need to do to write the book, and what did you learn that especially surprised you? A: I do a lot of research before I decide to move forward with a project. Sometimes there just isn’t enough research to write a successful story, and I have to abandon the project or put it aside until I can come up with a new angle. This is nonfiction, so you can’t just make stuff up to fill in the gaps. I began by reading lots of books and articles about the history of Little League, women in baseball, and Kathryn Johnston. I was shocked to learn that in 1951 Little League enacted a rule explicitly prohibiting girls from playing. And that rule stayed in effect until 1974! That wasn’t long before I started playing--how did I not know that?! Next I reached out to Kathryn for a phone interview. She was warm and generous and so intensely passionate about baseball. That’s when I knew I would move forward with the project. In fact she's still cheering for her favorite teams, throwing out first pitches at baseball games, and hoping to get called up to the Yankees! It was a thrill to finally meet Kathryn in person, and when the book came out we had a blast doing some school and library visits together. Kathryn’s brother was also a valuable resource, and Little League historians Lance and Robin Van Auken were incredibly helpful, answering my many questions and reviewing the final manuscript for accuracy. For most of my books I have to do experiential research to capture sensory details and understand what I’m writing about. I’ve been swimming with sharks and paragliding all in the name of research. But for this book, since I played baseball and softball for many years, I was way ahead of the game. Every book is a new research adventure! Q: What do you think Cecilia Puglesi's illustrations add to the book? A: I adore Cecilia’s illustrations. Her retro comic book style art is a wonderful nod to Kathryn’s favorite Little Lulu and Tubby comic books. When you read the book, look out for them in a few spreadsJ I especially love Cecilia’s historical details--from the Yankees poster on Kathryn’s wall to the 1950s decor and clothing. Q: What do you hope kids take away from Kathryn's story? A: I hope kids will be inspired to follow their passions, not give up when they bump into obstacles, and stand up for what matters to them. I think sometimes kids think that bravery and making change has to be something big. I hope they will see that smaller gestures or actions are just as important. Whether it’s writing a letter, raising money for a cause, or standing up for a friend, sometimes it takes many small steps forward (and some backwards) to cause change. A: I’m having fun working on a narrative nonfiction book about sharks. 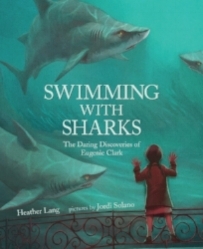 I fell in love with sharks when I wrote my picture book biography, Swimming with Sharks: The Daring Discoveries of Eugenie Clark, and I just can’t stop thinking about them! I’m also finishing up some final revisions for my next picture book biography, The Leaf Detective, about tree canopy biologist Margaret Lowman. This book is coming out in 2020 with Boyds Mills Press and is near and dear to my heart for so many reasons. Meg was one of the first scientists to really climb up into the canopy and explore its enormous biodiversity. She has done such important work to protect our trees, and she works tirelessly to mentor girls and women interested in the field. Last summer I spent an incredible week with Meg in the Amazon. She’s a phenomenal person and scientist. 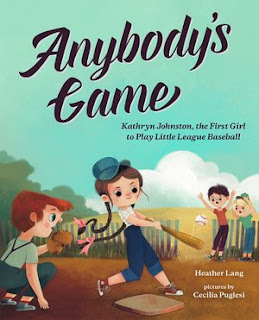 A: If you want to learn more about Kathryn and women in baseball, check out the Anybody’s Game page on my website. Don’t miss the Teacher’s Guide and a fun trading-card activity! Also, I do a limited number of free Skype visits with classrooms, and I love to visit with schools and book clubs. Thanks so much for chatting with me, Deborah!